2 x TV wall plate with feamle sockets on the front and rear of the faceplate outlet. Ideal television wall plate for plug and play install and no soldering required. 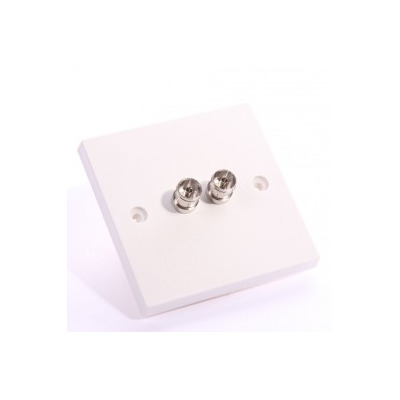 2 x TV socket plug and plug wall plate that requires no soldering. This 2 x television faceplate has two TV female socket connectors on the front and rear of the wall plate outlet. This TV installation plate is an ideal solution if you require two aerial connections and a simple and quick install. The wall plate is a single gang unit (86mm x 86mm) and fits a standard back box. Euronetwork manufacture, assemble and test their wall plates on site, in the UK. If you cannot find the combination you require or would like to know about flexible bulk pricing please contact our sales team on 01908371909 or email us at sales@euronetwork.co.uk.